A scene of times past. 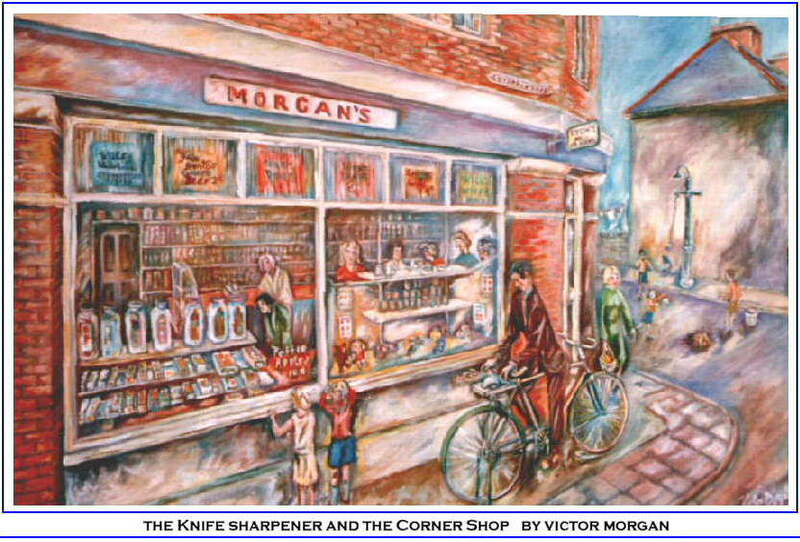 The old corner shop of Morgan’s at Fearing street Newport Gwent. It depicts a scene from time past. Romany knife sharpener did his service round. Kids played at swinging on the lamp post. Maw went to the corner shop to have a yap. The Community spirit of those days revolved around the local Club and Shop. On the book” A popular saying having credit for goods. The knife sharpener. A local man came from local Romany stock. Mr. Vaughan resides somewhere in Caerleon area. The bicycle adapted to drive a grinding wheel on the rear of the bike when peddled. Raised on a stand the rear wheel linked to the abrasive wheel enabling the operator to sharpen the knives on the revolving stone. er. Made from his own idea and inventive mind. And assembled with his own constructive talent. An ability so often found in the Romany people.